Karl Dargan’s first loss as a professional boxer in 2015 hit him hard. He ended up at a crossroads in life, considering his future in boxing. Meanwhile, he found success and love outside the ring in the music industry and on reality TV, eventually marrying “Love & Hip Hop” and “R&B Divas” star and recording artist Lil’ Mo. It seems the self-imposed break was precisely what Dargan needed to reboot his career and regain his hunger for the ring. He resumed training in Philadelphia with his uncle, the respected trainer Brother Naazim Richardson. 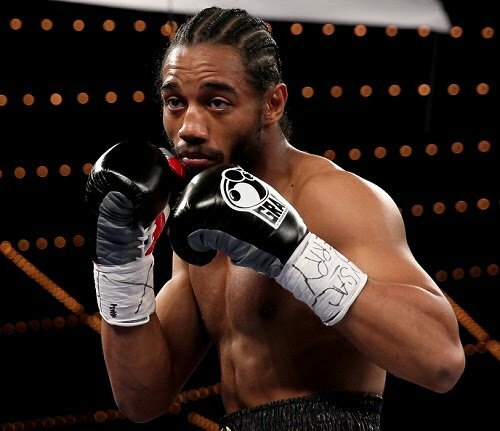 Dargan makes his return on Saturday, August 4, on the undercard of the Sergey “Krusher” Kovalev versus Eleider “Storm” Alvarez main event at the Hard Rock Hotel & Casino in Atlantic City on Saturday, August 4. The fight card will be televised live on HBO World Championship Boxing beginning at 10:00 p.m. ET/PT. Dargan (17-1, 9 KOs) will face veteran Jonathan Perez (37-22, 29 Kos) of Colombia in a six round lightweight division contest. Dargan chooses to look at his break from boxing as a benefit. “I’ve been in boxing 26 years,” said Dargan. “When you’re elite, you take things for granted. When something you love is taken from you, it gives you a whole different view. Dargan has rededicated himself, returning to his home town of Philadelphia to train. He credits his wife for taking on all the burdens at home to allow him to train without distractions. “My wife handles this so very well,” said Dargan. Dargan’s fans and supporters are eager to see his return to boxing. “It’s dope! After all that long time, my fans and my friends are actually excited to see me get back in the ring. A lot have followed me since I was a kid. They’ve always shown me support. I’m appreciative. “People come up to me and say, ‘we miss you in the ring!’ They don’t know how much I missed them. We all have adversity in life, it’s all how you deal with it and what you do afterward. I haven’t been this excited and hungry since I was a kid,” said Dargan. Richardson said Dargan isn’t much different three years on as a fighter. “In a division like his, it’s all about timing, and you have to find that. “Our top priority is to win. The second thing is to win without getting injuries. The third thing is to look good. But the top priority is the W. If he’s not cut or injured, we’ll put him right back in. I feel as though he can beat the odds. About Kovalev-Alvarez: In the first boxing event at the newly opened Hard Rock Hotel & Casino in Atlantic City, NJ, Sergey “Krusher” Kovalev will defend his WBO Light Heavyweight World Title against undefeated contender Eleider “Storm” Alvarez on Saturday, August 4, 2018. In the co-main event, WBA Light Heavyweight World Champion Dmitry Bivol will defend his title against Isaac “Golden Boy’ Chilemba. Tickets range between $50 and $200 and are on sale now through HardRockHotelAtlanticCity.com and Ticketmaster.com. The event is promoted by Main Events and Krusher Promotions in association with Groupe Yvon Michel and World of Boxing and will be televised live on HBO World Championship Boxing beginning at 10:00 p.m. ET/PT.